The Brooklyn Heights Cemetery and Mausoleums is staffed by caring people who want to help you. We would like to assist you by discussing the wide variety of options and services we offer and finding solutions that will best suit the needs of you and your family. The cemetery provides multiple burial options including mausoleums with entombment crypts and cremation niches, a double-depth lawn crypt section, and traditional in-ground burial. Our caring, knowledgeable staff is always here to assist you in making the best choices. For those who may prefer above-ground entombment in a crypt inside of a mausoleum. Entombment is the interment of human remains in a tomb or crypt, and today is most often referred to as above-ground burial. It involves placing a casket in a crypt within a mausoleum. For those who may prefer above-ground inurnment in a niche inside of a mausoleum. For families choosing cremation, we offer niches in our mausoleums. A niche is similar to a mausoleum crypt, only smaller, designed to hold an urn. It offers the same peace of mind as a mausoleum crypt. Share a single grave space as well as the same burial vault. A Lawn Crypt is a traditional single grave space with a double depth outer burial container previously installed with provisions for drainage throughout the Lawn Crypt section. For those who may prefer in-ground interment. In-ground interment is what many people think of when they picture a cemetery. This is full- body interment (in a casket). Spouses and loved ones can be side-by-side, together beneath the magnificent trees and the open sky. For those who may prefer in-ground inurnment. In-ground inurnment is a resting place for the cremated body (inside an urn). Memorials serve two purposes. 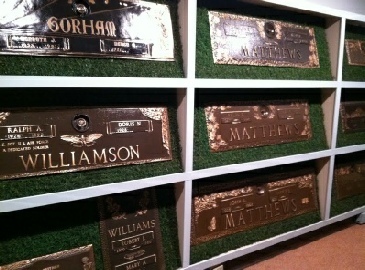 They help in locating your lot and provide a personal tribute to the life of a person. Brooklyn Heights Cemetery cares about your memorial in our cemetery and how it will look long into the future. We will work with you to match the location and style of memorial you desire.